The Al Tariq and Sejeel guided bombs. 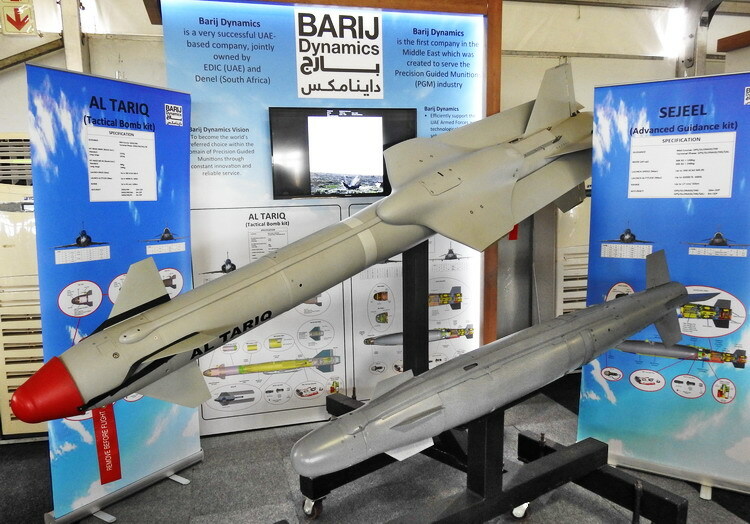 Barij Dynamics, formerly known as Tawazun Dynamics, is actively promoting its range of guided bomb kits on the international market, having supplied a large number weapons to the United Arab Emirates (UAE) armed forces. Barij Dynamics was, until October 2018, known as Tawazun Dynamics, but changed its name after investment from the Emirates Defence Industry Company (EDIC), which was established in 2015. EDIC is tasked with looking after the UAE defence sector and comprises over a dozen different companies that cover air, land and sea. This includes vehicle and vessel maintenance, shipbuilding, intelligence and training and the production of munitions, armoured vehicles and small arms. Some 10 000 people are employed by the different companies in the EDIC stable. The company’s first product was the Al Tariq bomb kit, which was ordered through a 2011 contract with Denel. This order resulted in the establishment of the Tawazun Dynamics joint venture, with Tawazun Holdings having a 51% stake and Denel 49%. The Al Tariq is based on the Denel Umbani, development of which began in 2002. This improves the accuracy and range of Mk 81 (125 kg) and Mk 82 (250 kg) aerial bombs. It provides the user with an all-weather, day or night operational capability, utilising GNSS/INS (Global Navigation Satellite System/Inertial Navigation System) guidance for mid-course guidance and a choice of either imaging infrared (IIR) with a complete automatic target recognition (ATR) capability or a semi-active laser (SAL) seeker for increased targeting accuracy. The weapon comes in a standard Al Tariq-S configuration that has a range of around 40 km, or the Al Tariq-LR that adds a large fold-out wing kit that extends the range to around 120 km. Maximum launch speed is up to Mach 0.9 at up to 40 000 feet. The weapon is easily integrated onto aircraft as it uses a normal Mk 80 bomb pylon to carry the weapon – it is wirelessly programmed from the cockpit, or can be fully integrated on the aircraft bus. The Al Tariq has been in production for a number of years (in November 2013 Tawazun Dynamics received a large contract from the UAE Air Force for Al Tariq for its Mirage 2000-9 fighters) and has been deployed. In 2015 the UAE signed a contract for the development of the Sejeel guided bomb kit with Tawazun Dynamics, with development work done by Denel Dynamics in South Africa and production in the United Arab Emirates. The Sejeel bomb kit adds GNSS/INS and/or SAL guidance to Mk 81 and Mk 82 bombs. It can be programmed with different attack profiles, and has off-axis and moving target attack capability. Range is more than 25 km, with a circular error probability (CEP) of less than 3 metres for the GNSS/INS/SAL version and less than 10 metres for the GNSS/INS version. The Sejeel has been in production since 2017 for the UAE armed forces, but Barij is now looking to export the weapon. As part of its marketing efforts, Barij took part in the Rheinmetall Denel Munition (RDM) Ammunition Capability Demonstration that was held at the Denel Overberg Test Range outside Arniston between 18 and 21 March. A Mk 82 Sejeel with GNSS/INS guidance was launched from a Hawk Lead-In Fighter-Trainer from the South African Air Force. It impacted less than six metres from the centre of the target after being dropped from an altitude of 35 000 feet, passing through clouds on the way down. Barij Dynamics is focussed on precision guided munition development and production, and sees this as its core business. It recently expanded its range with a guidance kit for the 2 000 lb Mk 84 series bomb. This was launched in February at IDEX 2019 in Abu Dhabi. This strap-on kit features GNSS/INS and SAL guidance systems.